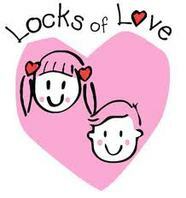 Their mission is to return a sense of self, confidence and normalcy to children suffering from hair loss by utilizing donated ponytails to provide the highest quality hair prosthetics to financially disadvantaged children. The children receive hair prostheses free of charge or on a sliding scale, based on financial need. HAIR IS MY BUSINESS is committed to supporting this great charity and offers free haircuts, shampoo and style to those who donate 10 inches or more of their hair to Locks of Love.